This section will quickly touch on the basics of what our system can do. When done with this page, just mouse-over the "START HERE" button to select more information about each of these subjects. QUICK NOTE ABOUT OUR SITE! Our left-side main menu is structured with drop-down selections. Whatever button you select will stay UNDERLINED. If you hover your mouse over that menu item the drop-down box will further tell you which page you're on in that particular grouping. We have a lot of information here and hope you find this menu design an easy way to navigate. So let's start with what "PCB Fab-In-A-Box" can do. The PCB pic below is a prime example. 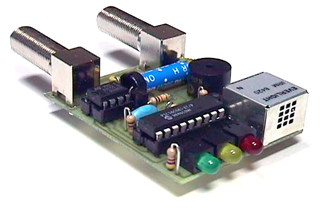 This double-sided board is less than 1 square inch for starters! Take note of the holes on the sides which are for the final addition of conventional .1" headers, but it's what's IN BETWEEN these holes (SMT capacitors) that makes this the ideal example sent in from one of our customers. The process of transferring toner by re-fusing an image to a copper surface began back in the early 90's. It has come a long way since then, turning it from an 'art' to a 'science' as a dependable, repeatable, high resolution method for instant PCB fabrication. Board size up to 8"x10"
Trace pitch down to .005"
Customer support in the USA! Mini Mass-Production? Yes! It's simple and practical. The ideal solution for both start-up businesses and those with low volume or custom products, to be able to maintain control over production costs. There is no need to send out for a 100+ boards to be made when you can make just the quantity you need 'on demand' plus, there's no wait times! There is more labor involved but that's a simple trade-off for keeping costs extremely low. Prototypes and 1up Special Projects? You bet... simple, fast and inexpensive! New product design normally goes through several iterations before everything fits exactly right. Why send off for expensive "proto" PCBs for each redesign or component reposition? PCB Fab-In-A-Box® allows you to make change after change without the high expense and long wait times of multiple "proto" boards being sent out to be fabricated. DIY and save a bundle of time and money. Of course once the design has been finalized, by all means have a pre-production board made. The point being... with our system, you should only have to pay for a pre-production "proto" board just ONCE! And equally important for prototype boards and most 1up projects, the PCB is only half the game. What about WHERE the PCB is going? Whether it's a 1-up project or a prototype for developmental R&D, you need the enclosure to look as good as the board, right? 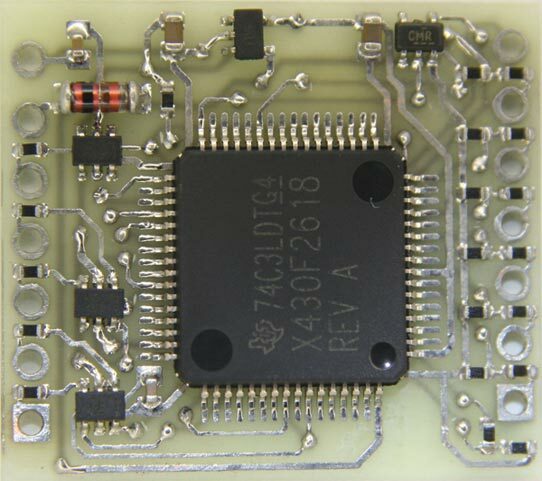 Our sister product "DecalPROfx.com" was developed back in 2003 from of the basic concept of this PCB fabrication product. DecalPro enables you to make your own real, pressure-sensitive "dry-transfer graphics" in 8 minutes to give your enclosures a very professional, commercial quality looking finished product. This is a "must see" as there is nothing else like it on the market to enable YOU the end-user to be able to make your own custom images "on-demand" in about 8 minutes. It's a first of its kind and extremely powerful. 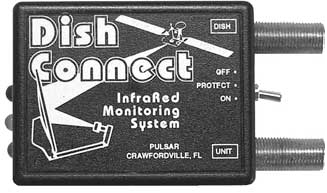 The 2" x 3" project enclosure shown above was created with DecalPRO using nothing more than a B&W laser printer then fusing the White foil over the toner image with a "laminator" device we call a Toner Image Aplicator or TIA. DecalPRO also contains 19 special foil colors (grouped into pigments, metallics and special effect foil colors) in addition to converting black toner white! Can you say, "I must be dream'n"? We will introduce you to DecalPRO® later and how it dove-tails perfectly with this PCB Fab-In-A-Box® to give you unlimited power to create your entire project totally in-house, on your schedule, for pennies per square inch. There is nothing on the market that can do for you what this can do... and the best part, it's not an expensive proposition. Our two processes, this "PCB Fab-In-A-Box" and "DecalPRO" are similar in execution and share common use of the Toner Image Applicator (TIA), the Toner Transfer Paper (TTP) and the White foil (1 of the 19 foils of the DecalPRO system). 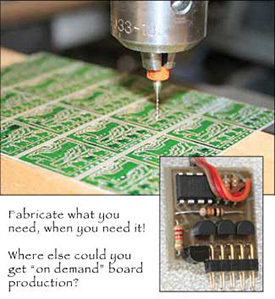 This redundancy reduces your over all cost to be able to incorporate both the PCB fab and pro graphics for each product you make. Together they are an extremely powerful set of process techniques. NOTE: If you are new to making your own PCB's or a seasoned user of our products, our Tech Support is always here to help you make perfect, high resolution boards in minutes. Call us anytime! We're located in Colorado Springs, CO. Our hours are 9am to 5pm MST. Call us at (850) 926-2009 if you have any questions or concerns. Our Tech Support is unmatched by any other company!